The Friday the 13th movies have dominated the decade and Jason Voorhees has become a cultural phenomenon. I’m a huge fan of the series despite its many shortcomings and as a lover of all things horror, I was delighted to see a game adaptation. As we’ve witnessed, most NES games based on movies such as Indiana Jones, Rambo, and Ghostbusters have been dreadful. I was intrigued by how this franchise would translate to the Nintendo given the violent nature of the movies. I can certainly say this game is creative and significantly different than other action games on the market. You are tasked with the near impossible goal of defeating the practically indestructible Jason, while protecting your fellow camp counselors and the defenseless children. Just like the movies, the game takes place at Camp Crystal Lake. You choose from six different counselors all with varying ability levels, such as running speed, jumping, and rowing. Mark and Crissy are the best characters to start with and you can easily switch during gameplay. All six of you begin with full health and rocks as weapons. An infinite number of zombies constantly emerge from the ground and you can jump over them or kill them. Defeating zombies will eventually cause upgraded weapons to appear, which are essential since the rock and dagger are virtually ineffective against Jason. There is a map that can be viewed when you pause so you know your location as well as the other five counselors. Without this, the game would be impossible as the settings are so repetitious. There are about 20 cabins big and small dotting the main path, two sets of woods that are unmapped, a cave that requires a flashlight to explore, and a set of cabins on the lake that house the children. Jason attacks early and often, so there is little time to explore. When he attacks an alarm will sound and a 60-second countdown will trigger. He is either attacking another counselor or the children and the map will indicate which cabin he is in. You must get there within the allotted time or Jason will murder the counselor or several children. If you lose all of the children or all of your team members perish the game is over and the nightmare begins anew. Losing a fellow counselor sinks your chances of victory so you need to take every measure to rescue them. You can either travel there as your current counselor or when inside a small cabin you can change to any of your five companions. When you enter a cabin, the viewpoint changes from a simple side-scroller to an over-the-shoulder view that reminded me a lot of the rooms in The Goonies II. Once at the correct cabin, a showdown with Jason begins. Battles against him are similar to a simplistic version of Mike Tyson’s Punch-Out!! You must dodge his attacks and hurl your weapon at him. You’ll deal a little damage and he’ll vanish. It takes many times and a strong weapon to knock out Jason’s energy bar. You’ll also have to defeat him three times as the game takes place over a span of three days. After each day Jason comes back stronger and faster. Jason will also randomly attack on the main path and on the lake. This part of the game is incredibly unfair and difficult, as unlike the cabin battles there is no time to prepare for these. You must fire your weapon and attempt to avoid him until he goes away. Most of your deaths will happen on the main path. Although the majority of the game is spent finding and fighting Jason, there are several other things you can do. There are six large cabins. Lighting the fireplaces in all of them will give you a special item and notes with hints will appear in these as well. Upgrading weapons is an essential part of the game. Weapons will appear on the screen after so many zombies are killed. You can trade weapons with a teammate when in the same cabin and having several team member armed with at least a machete makes victory over Jason possible. If you choose to navigate the woods or the cave, there are secret rooms which contain special weapons and items, including Jason’s lair in the cave which contains his mother’s severed, yet living head. These areas are difficult and have unmapped mazes. It is easy to become lost and have Jason slaughter one of your friends during that time. The soundtrack for Friday the 13th is awful. Ninety percent of the game is spent on the pathways and we get the same boring and lazy music that loops every five seconds. I’m not exaggerating, the entire soundtrack loops like no other I’ve heard before. The only interruption to this is the screaming alarm that is warning you about Jason. Even the cave and the woods don’t give us anything new; it is the same pathway tune. During the battles with Jason the music is even worse, as the same two notes just bleep at you. Inside the cabins there is a major improvement as we are treated to an ominous tune that does fit the horror theme of the game. However, this nowhere near makes up for the poor soundtrack. The graphics and color look okay in the game and are passable with lots of green, blue and brown, but the problem is the repetition. We are given little variety in the settings and enemies. The cabins are all empty and there is zero visual difference between them inside or out. With seven movies in the franchise, more details and references to the films would have been a nice touch. Aside from Jason and his mother, there are only the endless horde of zombies, along with a few crows, bats, and wolves. Although Jason will no doubt startle you when he pops out and attacks, he does look ridiculous wearing a solid purple jumpsuit. This game is loaded with issues. Average graphics and a horrible soundtrack mixed with repetitious, difficult and often unfair gameplay should spell out a disastrous product. However, I still managed to have a pretty good time with this title. 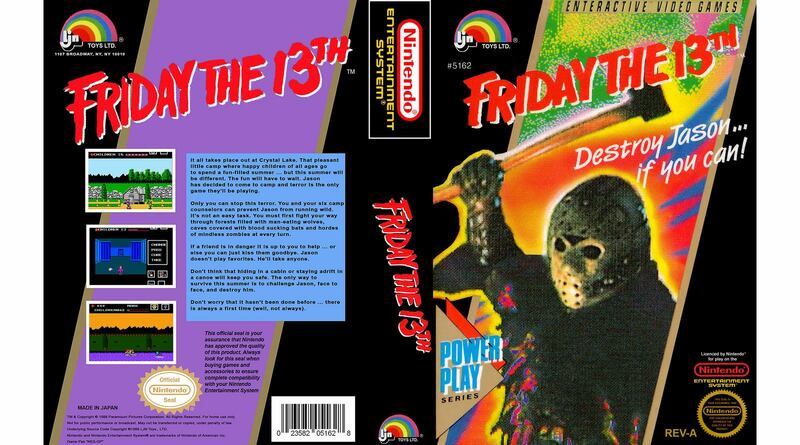 I love to see horror mixed in with video games and Friday the 13th is a unique Game Pak with some great ideas. The sense of survival and strategic planning made this a really fun and challenging game for me. With the upcoming eighth film taking place in New York, perhaps we’ll see a sequel with some improvements and new ideas. Friday the 13th is a mixed bag for sure. I can see many being turned off by all of its problems, but others loving the challenge and horror theme. Any fan of the movie franchise should get some enjoyment out of this. I would say this game is certainly worth a look, however going directly from outstanding games like Blaster Master and Zelda II to this will surely disappoint.